There is so much to do on Maui that it is possible to forget to stop and enjoy the views. With this in mind, one thing I try to do in all of my Maui activities is to make sure that either at the end, or somewhere in the middle, there is a chance to be reminded that yes, I am on Maui. Visiting South Maui’s 5 Palms Restaurant can accomplish this feat. But first getting there is half the fun. 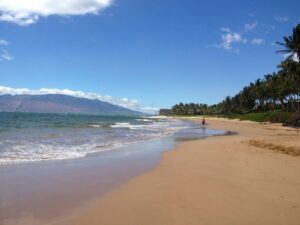 One of my favorite walks from Wailea’s Ekahi Village is north along Keawakapu Beach from Wailea toward Kihei. The white sandy beach is wide and offers a great place to walk, run along the waves or even just lay down and catch some rays. The Perfect Beach in South Maui – Keawakapu. The beach walk is only about 1 mile to 5 Palms so you can run, or wall back and forth a few times. But my favorite activity is to leave Ekahi about 4 PM. Walk slowly along the beach with your feet dodging the waves as they race up the shore. If you are here during whale season, you can even stop and be see the occasional breach or more frequent spout of water as these huge mammals exhale. Your reward for this short, but sweet walk is waiting for you at the end. 5 Palms has a great Happy Hour Menu – 1/2 off sushi & pupus. The best part is the time of their Happy Hour. Unlike many others on Island, 5 Palms has a true Happy Hour from 3 pm – 7 pm and 9 pm – 11 pm. Why leave Ekahi at 4 PM. 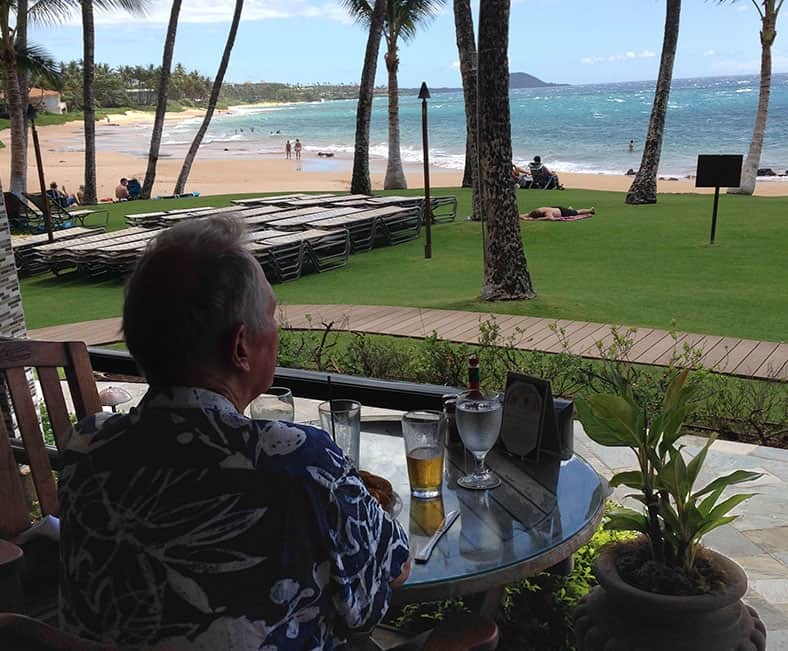 Well, the short walk will get you to the great spot in time to sit back, relax and enjoy a cold drink while you catch the best sunset on Maui.